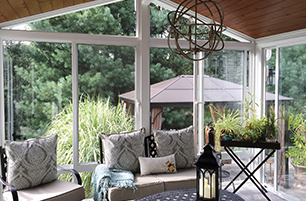 ​Adding a sunroom is one of the easiest ways to add value to your home, while bringing character and the natural beauty of the outdoors inside. 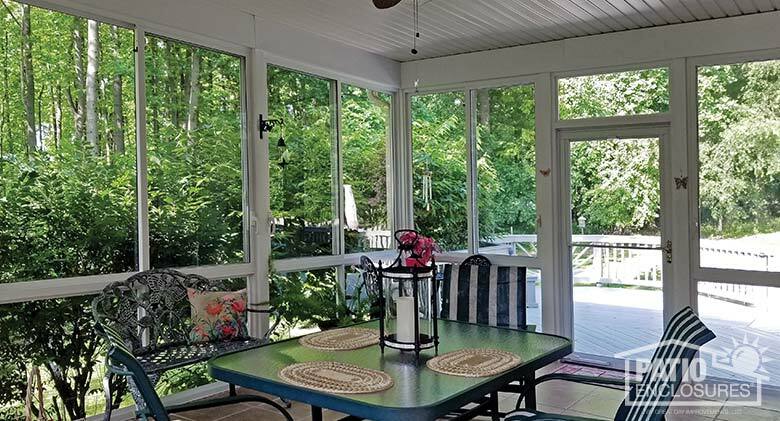 Our gable roof sunrooms provide maximum insulation and stability allowing you to construct a larger room that’s comfortable, spacious and peaceful. 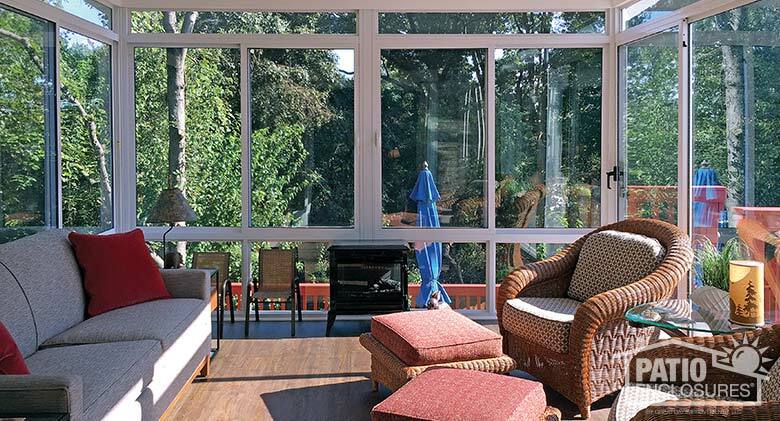 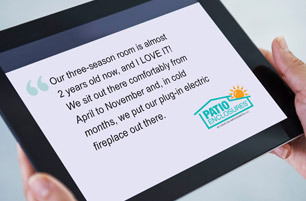 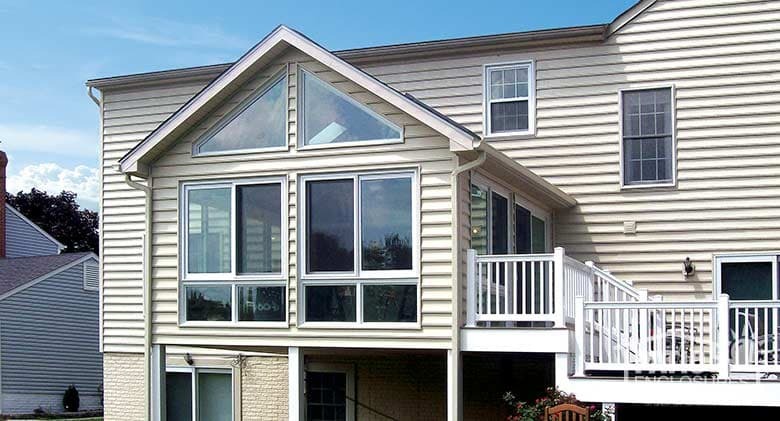 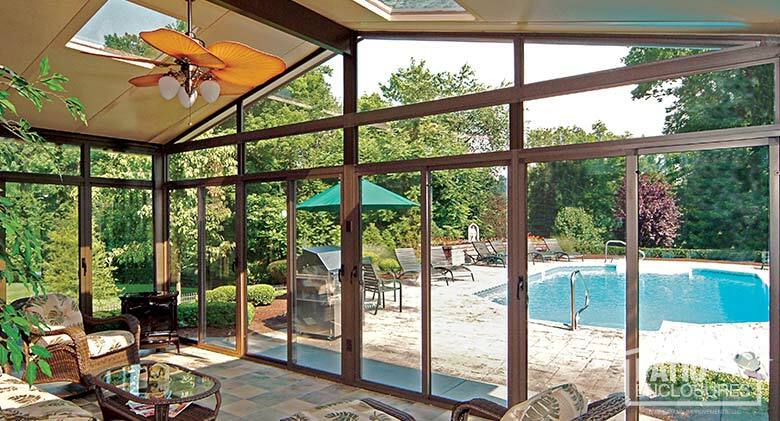 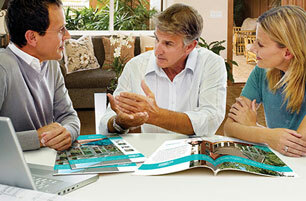 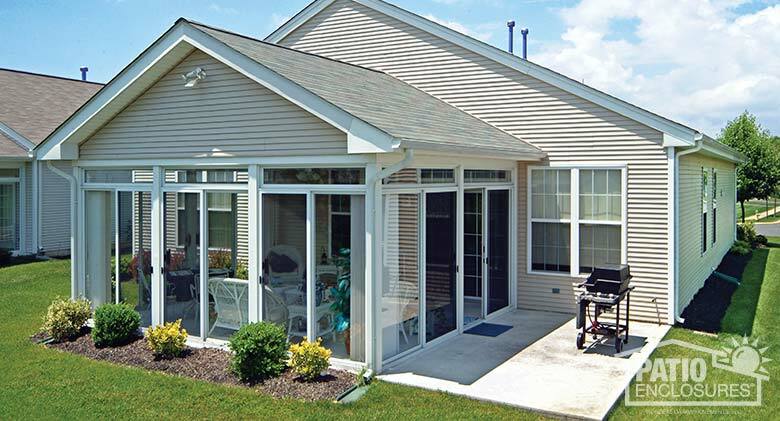 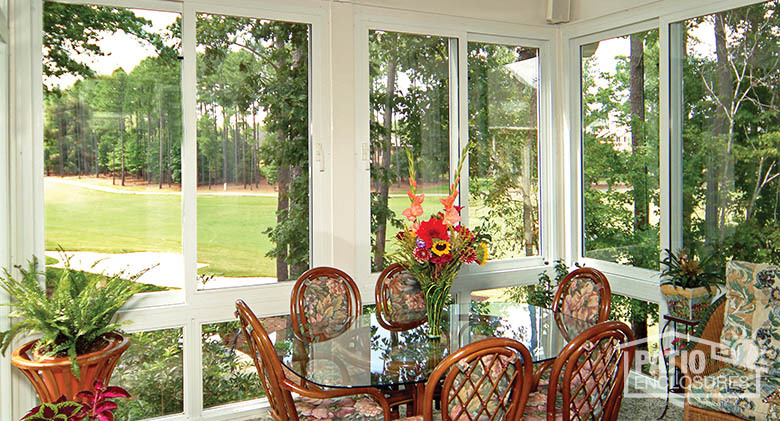 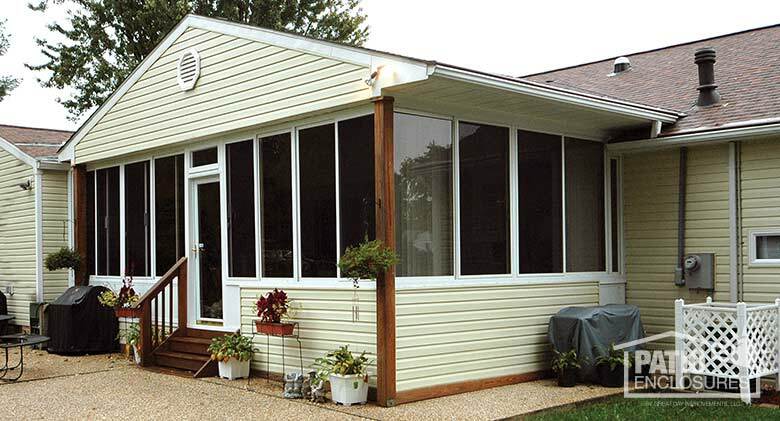 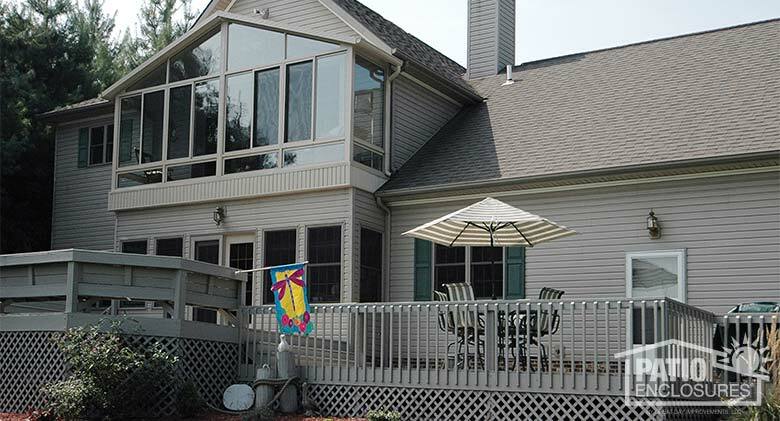 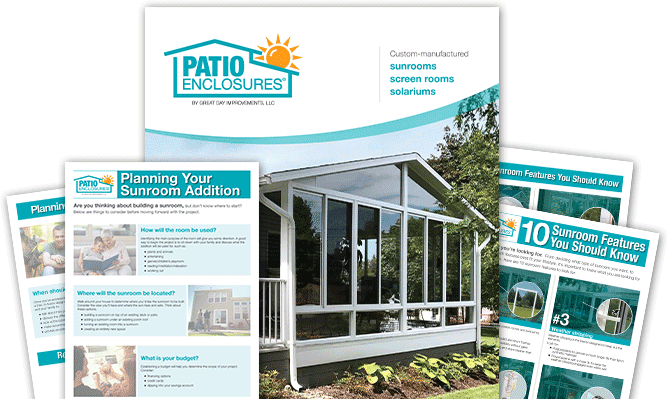 Relax and enjoy the outdoors every day in the comfort of your home with a Patio Enclosures Sunroom. 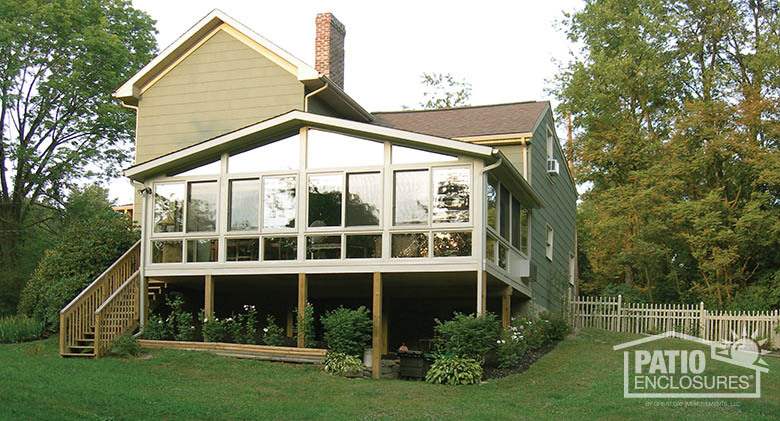 Three Season Sunroom Sandstone with custom gabled roof and glass roof panels. 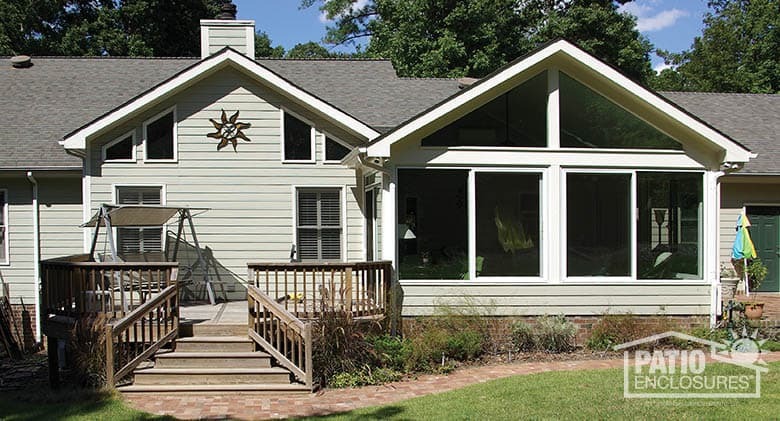 Three Season Sunroom Sandstone aluminum frame with custom gable roof. 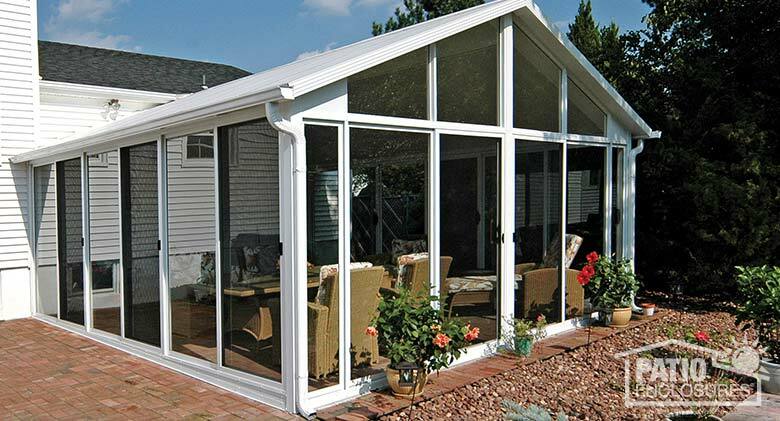 Three Season SunroomSandstone aluminum frame with gable roof. 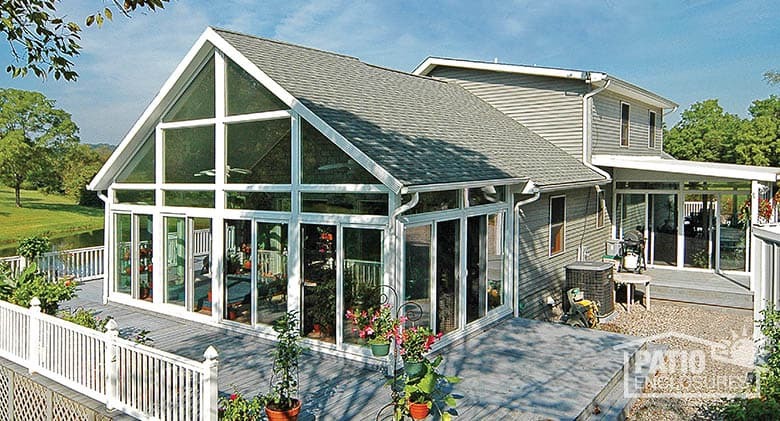 Three Season Sunroom Sandstone aluminum frame 2-story with gable roof. 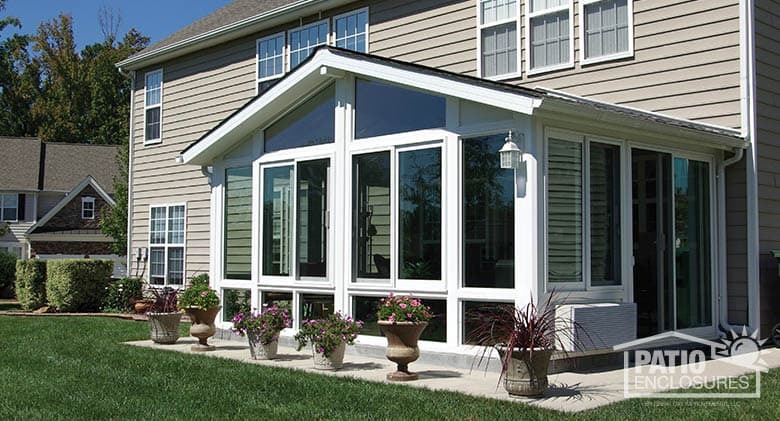 Three Season Sunroom Sandstone aluminum frame with gable roof. 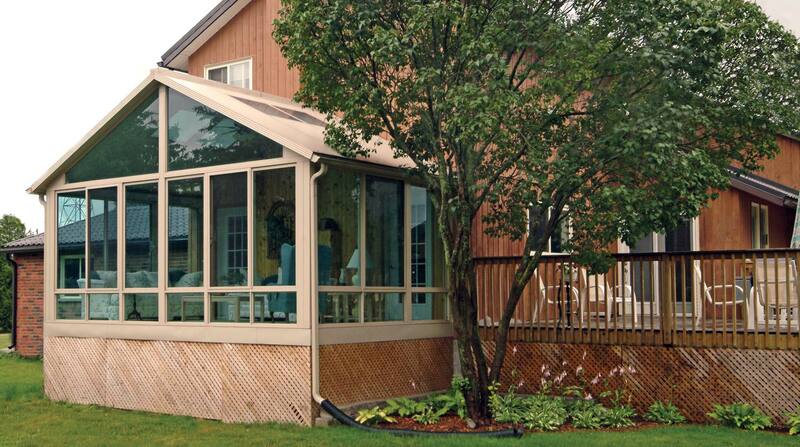 Three Season Sunroom Bronze aluminum frame with custom wood gable roof. 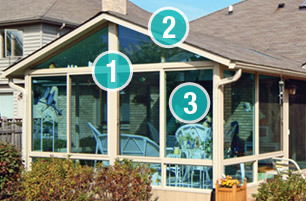 Three Season Sunroom Sandstone aluminum frame with gable roof and light blue tint glass. 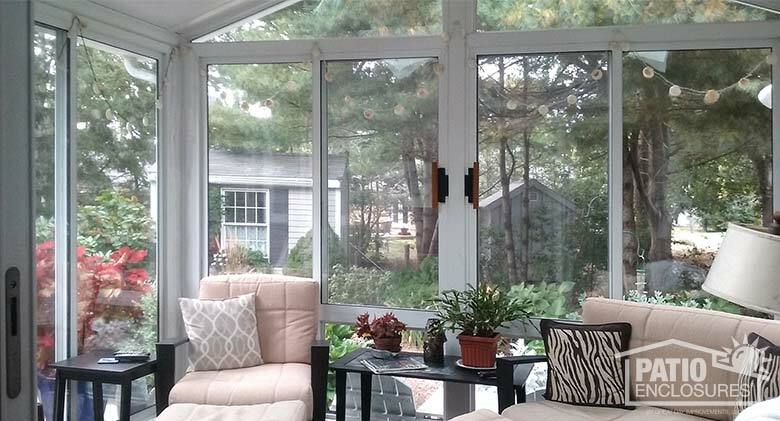 Three Season Sunroom White aluminum frame with gable roof. 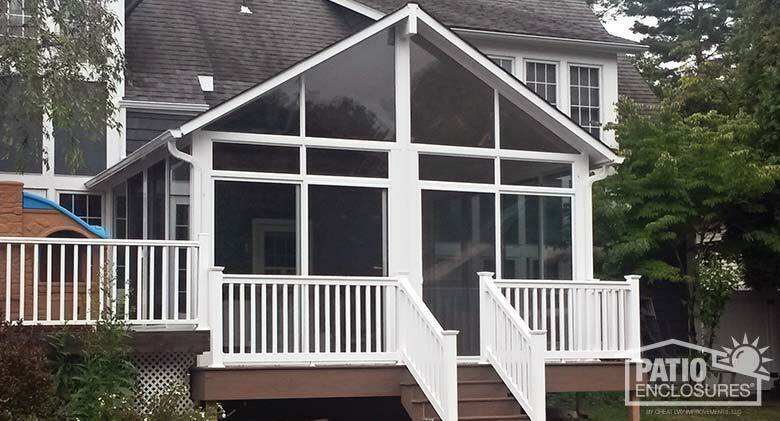 Three Season SunroomSandstone aluminum frame with custom wood gable roof. 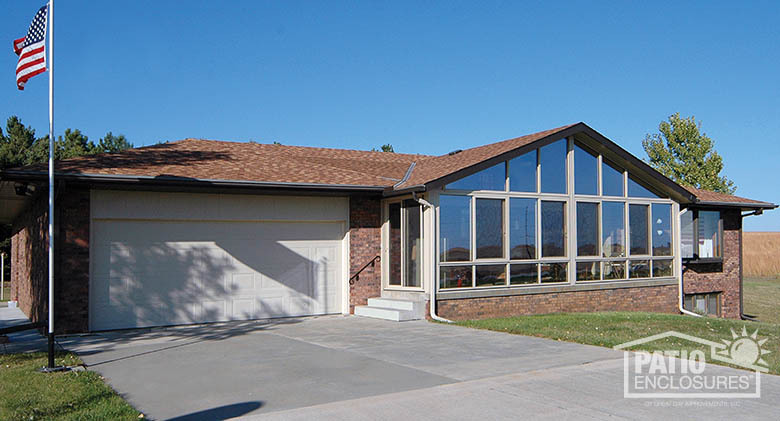 Three Season Sunroom Sandstone aluminum frame and glass wings in the gable roof. 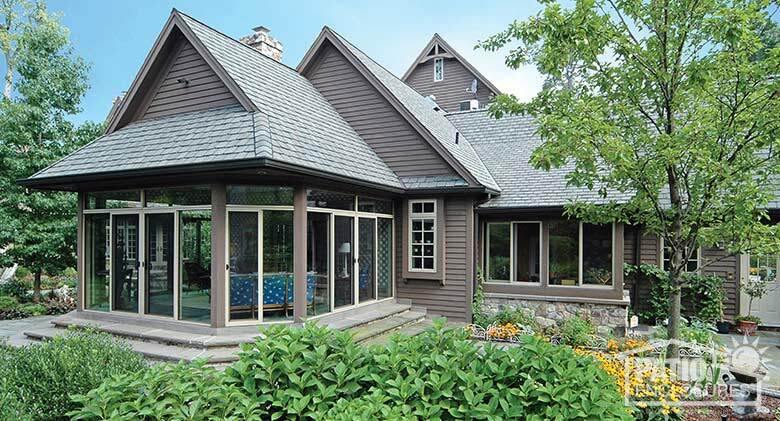 Three Season Sunroom Bronze aluminum frame and glass wings in the gable roof. 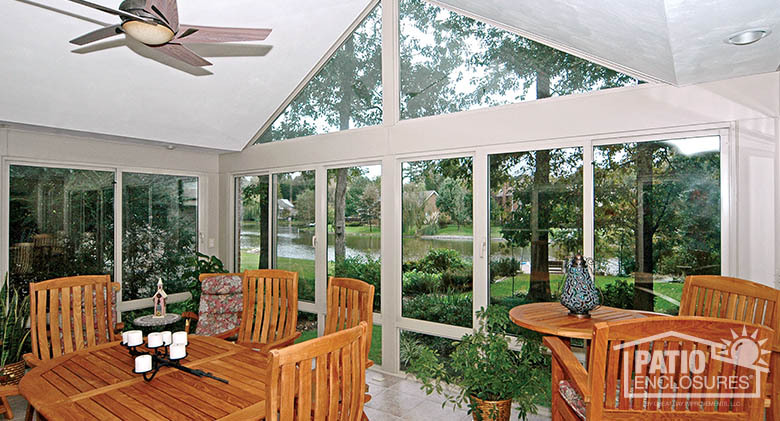 Three Season Sunroom Bronze aluminum frame, gabled roof and glass roof panels for added natural light. 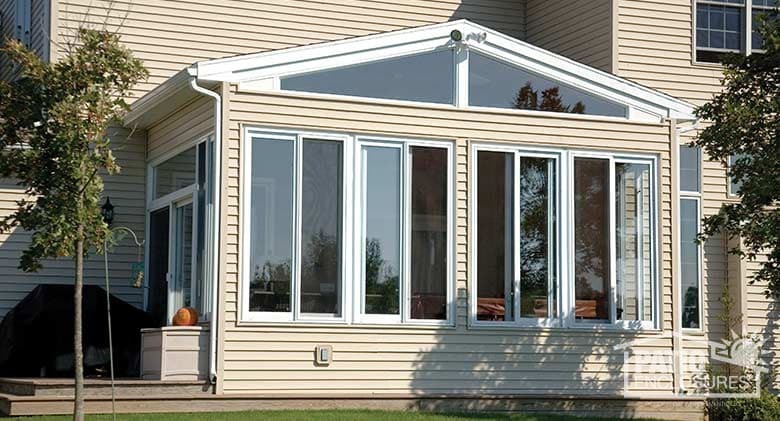 Four Season Sunroom Four Season aluminum sunroom in sandstone with gable roof, glass wings and solid knee wall. 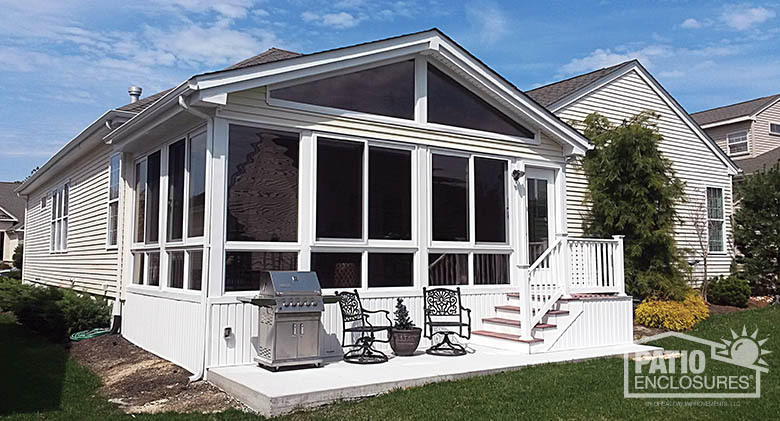 Four Season Sunroom Four Season vinyl sunroom in white with shingled gable roof with glass wings and glass knee wall. 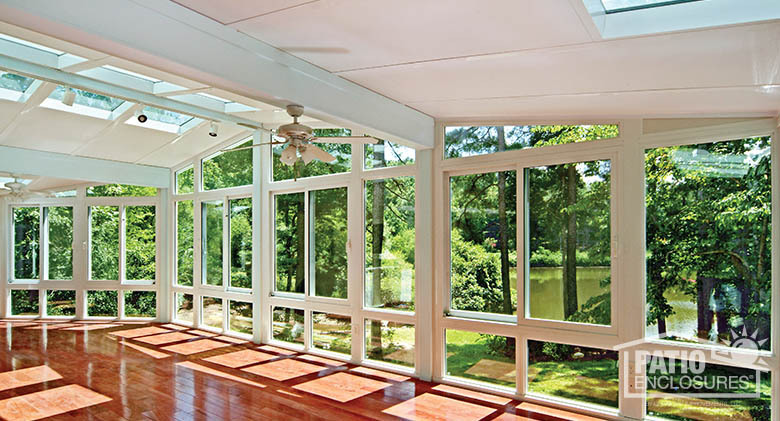 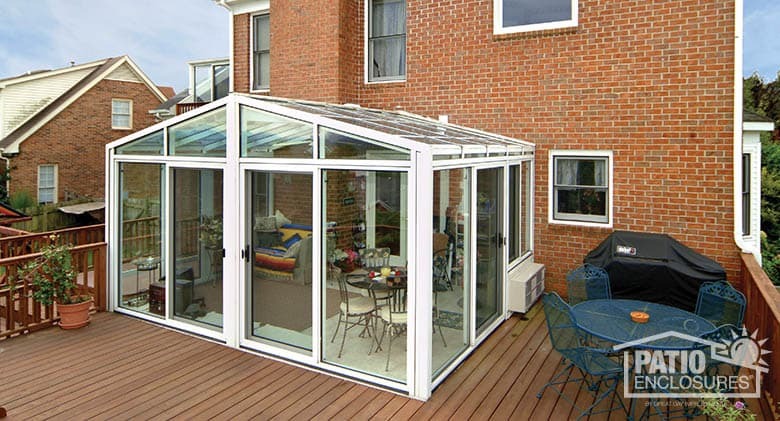 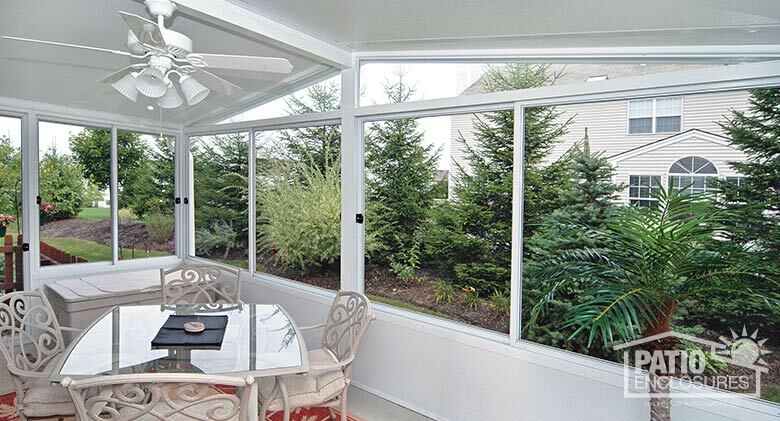 Four Season Sunroom White, Four Season aluminum sunroom with glass wings in a gabled roof. 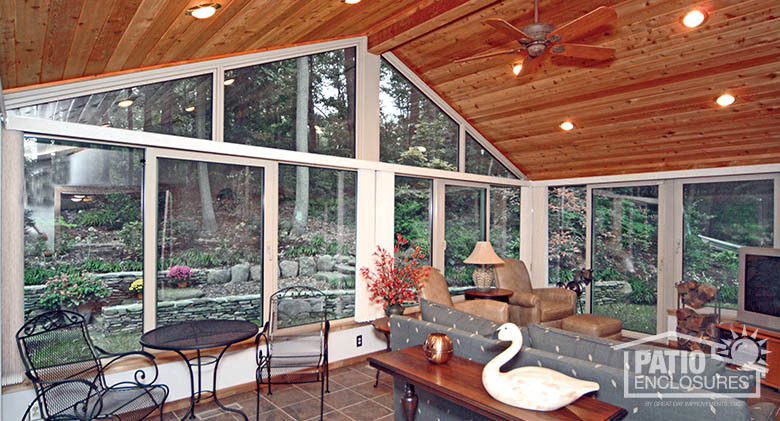 Four Season Sunroom Expansive views from this second-story vinyl sunroom in sandstone with glass wings and gabled roof. 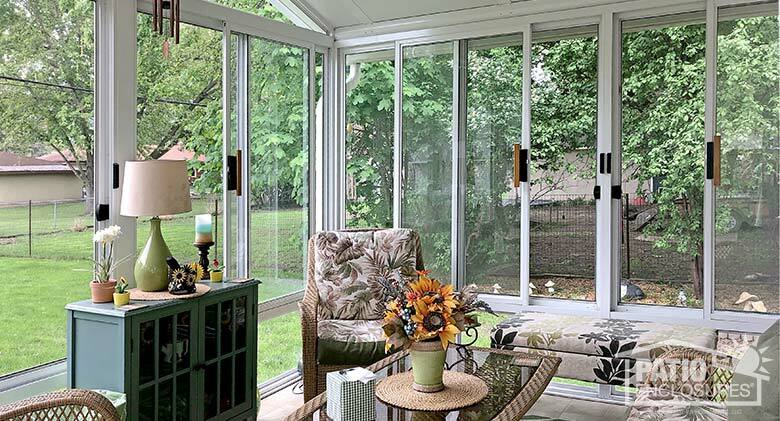 Four Season Sunroom White Four Season aluminum sunroom features gable roof with glass wings and solid knee wall. 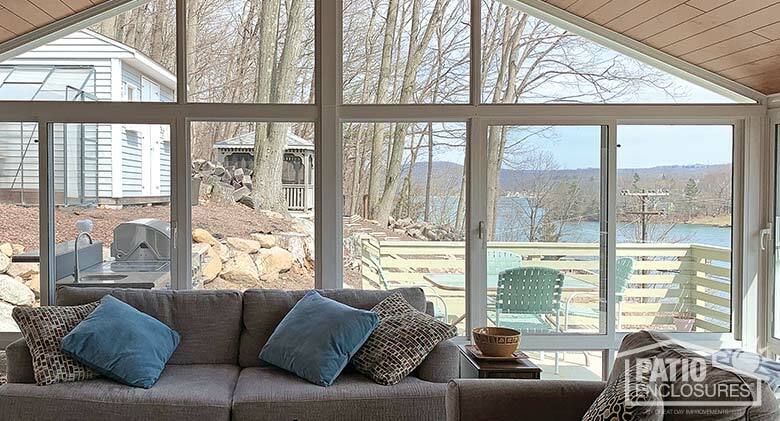 Four Season Sunroom Floor-to-ceiling windows provide expansive views from this vinyl Four Season sunroom in sandstone with glass wings and gabled roof. 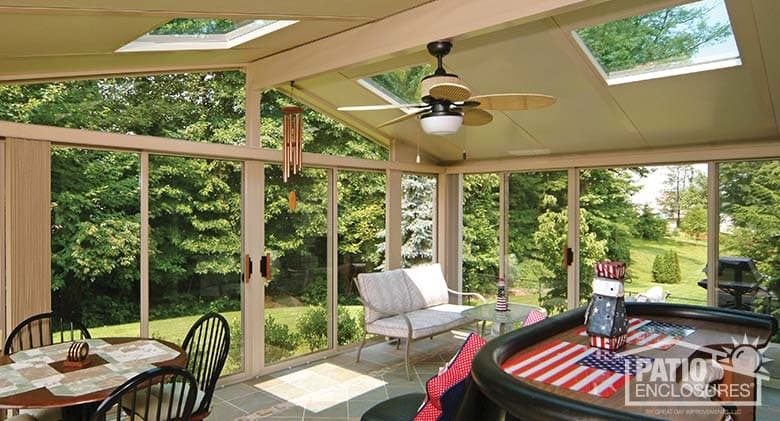 Four Season Sunroom Four Season aluminum sunroom in sandstone with gable roof, glass wings, and glass knee wall. 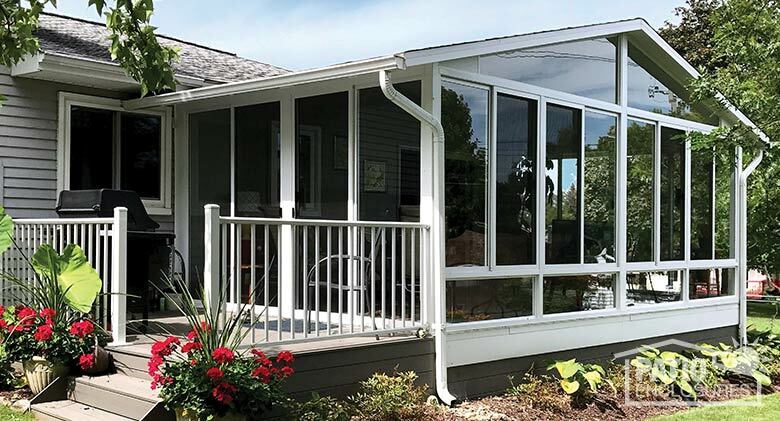 Four Season Sunroom White Four Season vinyl sunroom with glass roof panels in gable roof, glass wings and solid knee wall. 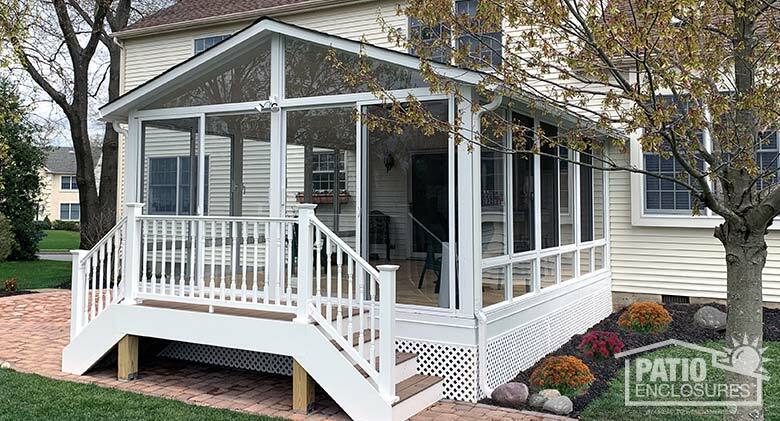 Four Season Sunroom Vinyl Four Season sunroom in white with shingled gable roof, glass wings and transoms. 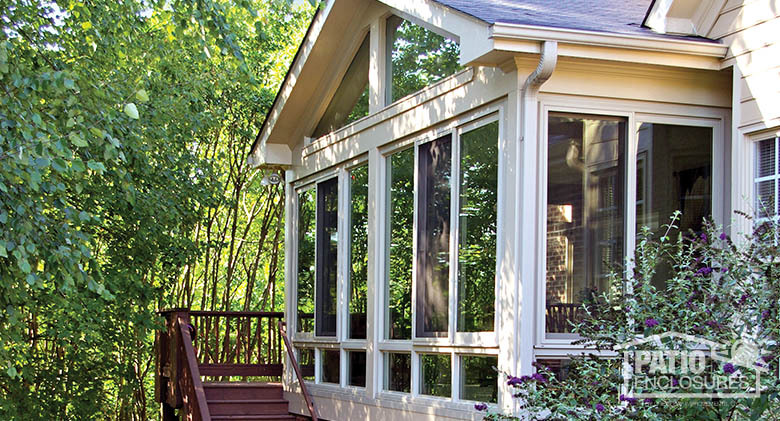 Four Season Sunroom Curb appeal and year-round comfort in this aluminum Four Season sunroom in sandstone with gabled roof. 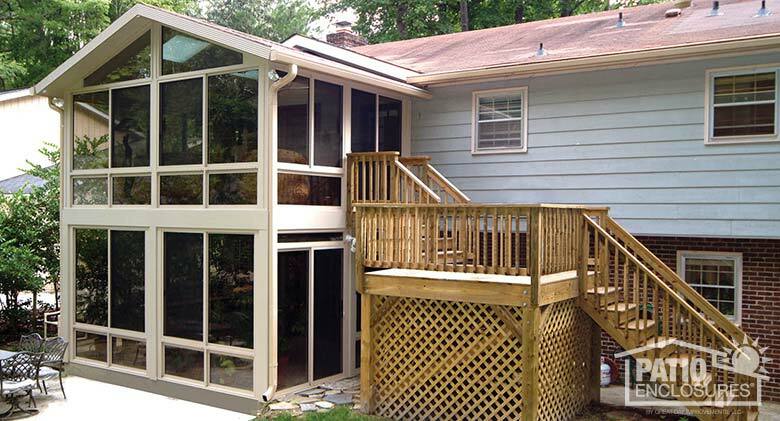 Four Season Sunroom Four Season vinyl sunroom with glass wings in gable roof, and glass knee wall. 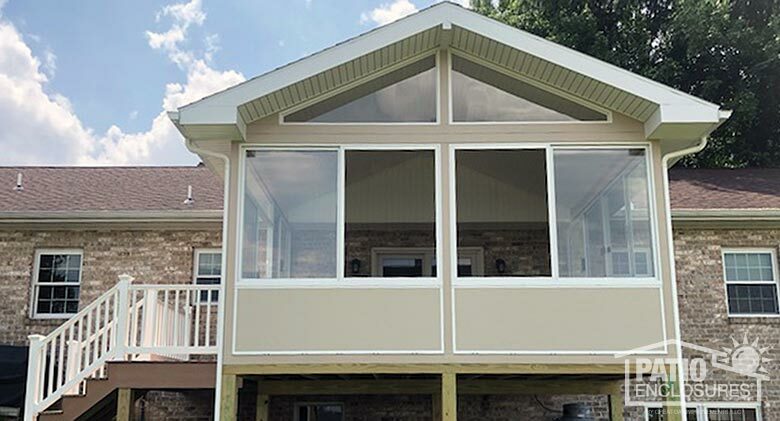 Four Season Sunroom Four Season vinyl sunroom in white with gable roof, glass wings, and glass knee wall is built on the second level to overlook the pool. 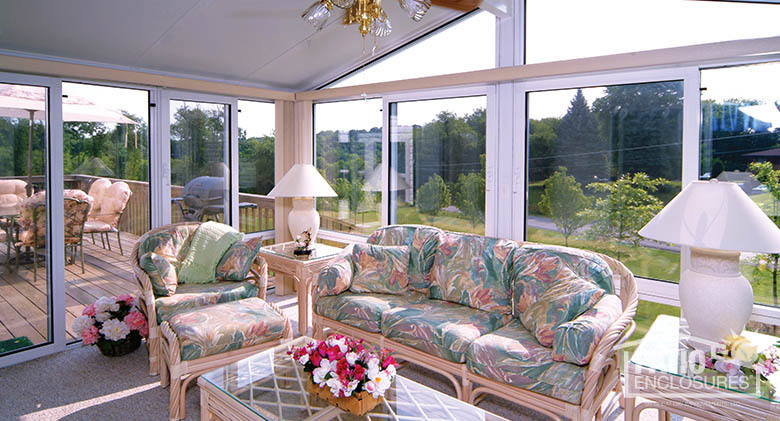 Four Season Sunroom Golf course views abound in this vinyl Four Season sunroom with gable roof and glass knee wall. 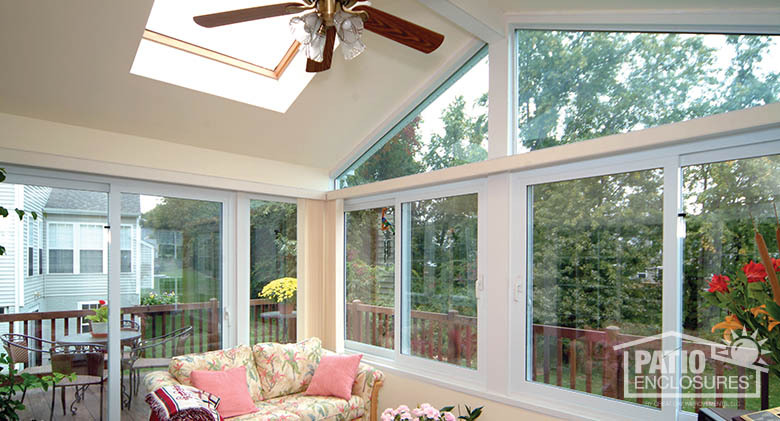 Four Season Sunroom Natural light fills this white vinyl Four Season sunroom with glass roof panels, gable roof, glass wings and glass knee wall. 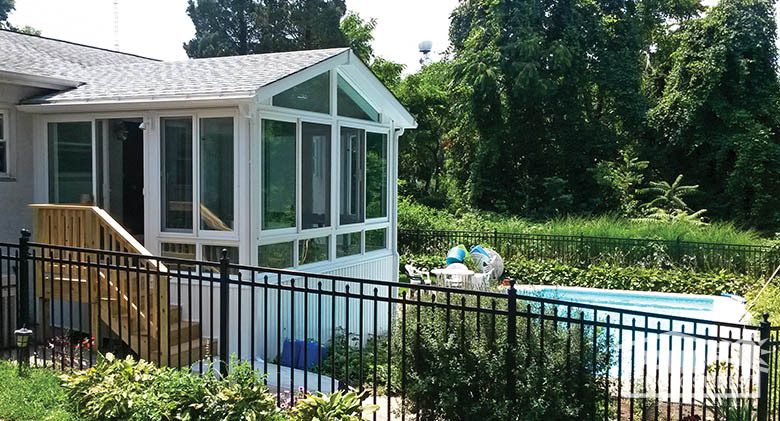 Screen Room Sandstone aluminum frame with custom gable roof. 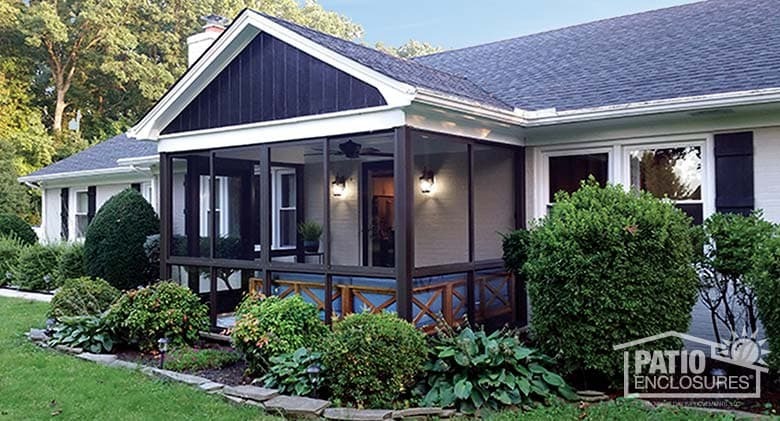 Screen Room Bronze aluminum frame with gable roof. 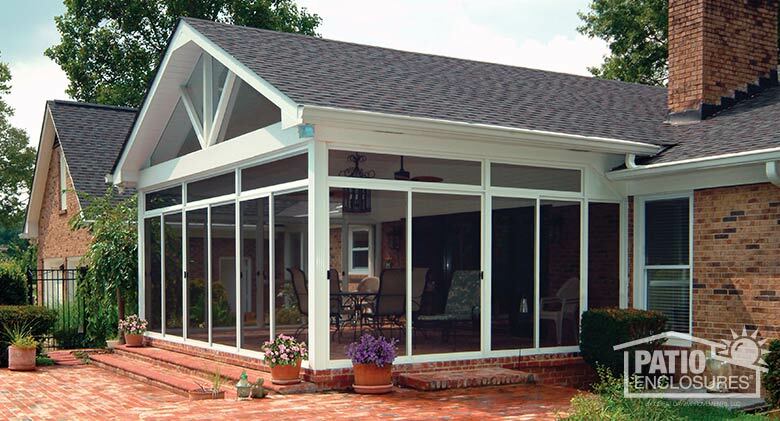 Straight Eave Solarium White frame with gable glass roof. 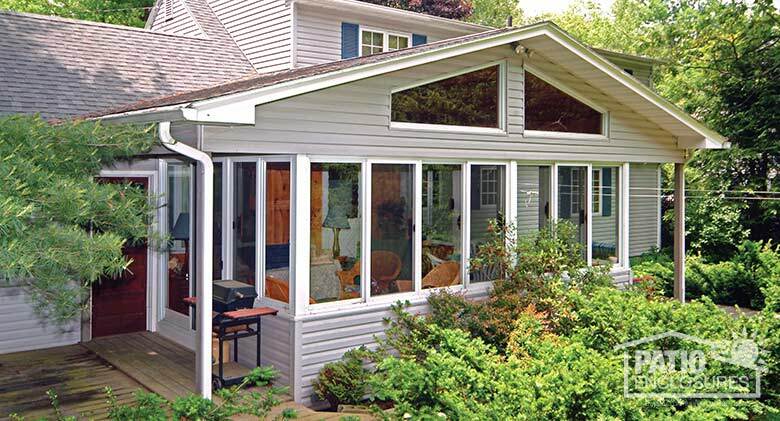 Traditional Sunroom Traditional sunroom replaced a portion of this raised, open deck for year-round comfort with gable roof. 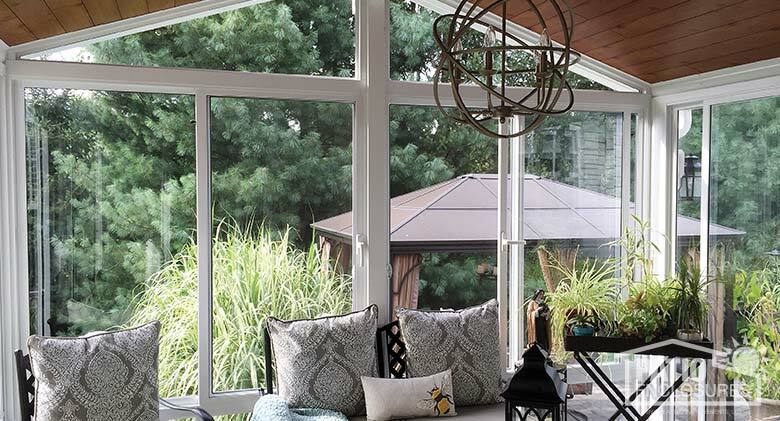 Traditional Sunroom Traditional sunroom with glass wings in shingled gable roof. 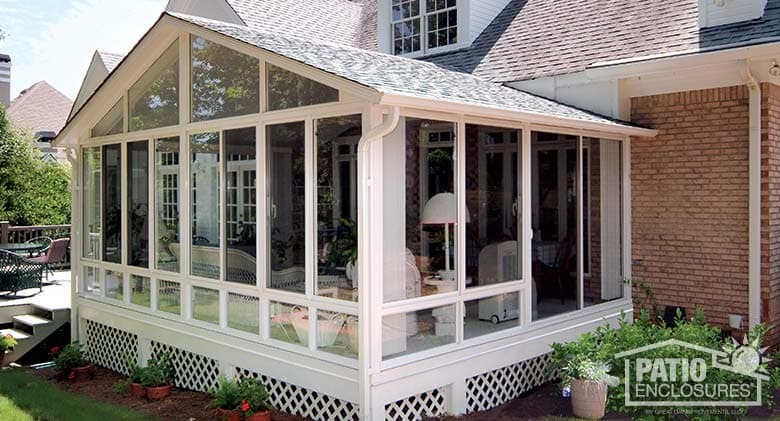 Traditional Sunroom Traditional sunroom with gable roof and wood trim.